The subarachnoidal space around the accessory lobes is very large and is connected with the dorsal lumbosacral canals. These lumbosacral canals are segmentally organized, transversely running bony canals in which the vertebral canal protrudes. The lumbosacral canals are lined by the dura mater and arachnoidea, the latter partially closing the canals towards the central lumen of the vertebral canal but leaving an opening directed to the accessory lobes. The lumbosacral canals are comparable to the semicircular canals in the inner ear. Movements of the fluid in the lumbosacral canals get directed to the accessory lobes where they cause mechanical stimulation of the neurons present. Experiments have shown that the lumbosacral system is responsible for balance and equilibrium during walking, whereas the vestibular system controls flight. Note: deformation of the spinal canal and distortion of the bony wall easily occurs in paraffine embedded tissues. 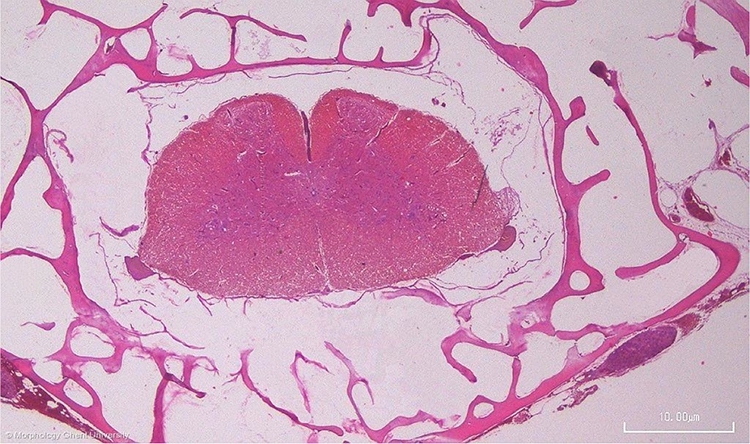 Nevertheless, the above micrograph gives a clear indication of the presence of lumbosacral canals.